Taste of T’ai Chi Chih” is a series of 20 separate, easy-to-learn moves that circulate and balance the chi, the life force that flows within us. It is not a martial art, but rather a moving meditation that reduces stress and generates vital health and peace of mind. In this fun and entertaining intro workshop you will be taught a few of the T’ai Chi Chih moves, which you can actually take away and practice on your own. You will also be taught how to ground the chi, which helps with focus, clarity, and feeling more present in everyday life. All sizes, strengths, and ages welcome. 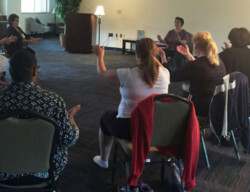 The moves during this intro to t’ai chi chih class may be done seated. Please wear comfortable clothes. Guided by Sharon Sirkis. Do you need to be close to the elevator? Do you have dietary restrictions? Please fill out the boxes below and our Guest Services Manager will contact you. We will do our best to accommodate your needs. Additional charges may apply.